If you ever been on beach or any other type of place where you can get tanned?Worried about your holiday tan? And you hate getting tan but love traveling. So don’t worry travel as much as you want and we are here to help you for removing that tan easily and permanently. Removing tan is really a tough job when you have to travel and work in market or for college projects. 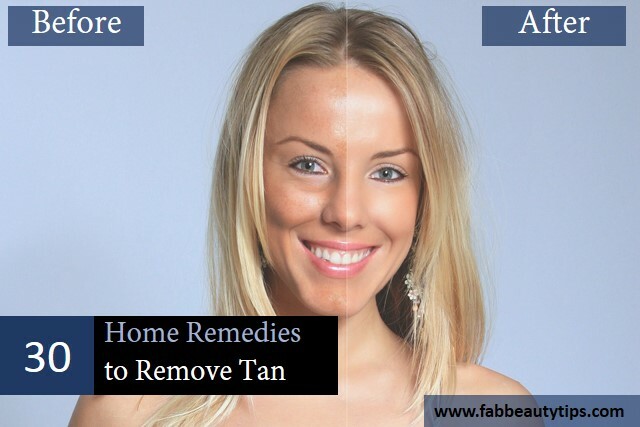 So here are home remedies to remove tan permanently from your skin and have a healthy and glowing skin. Slice the lemon and rub it on your tanned area. Leave it for 15 minutes then take the shower. Do this twice a day for better results. Lemon juice removes tan and marks from skin very effectively and make the skin lighten also as it has acids which helps to lighten the skin. Mix both the juices together. Apply on tan area with the help of a cotton ball. Lemon remove the tan and cucumber soothes the burns and itchy area so that there is no harm to the skin. Mix the gram flour, turmeric and water to make a smooth paste. Apply this pack on the area where you get tanned and leave it for 20 minutes. Gently remove this pack in scrubbing motion. Use it on every alternative day. If you want to remove tan by making your skin flawless than this pack is perfect. Gram flour remove the tan, turmeric treats the sun burns and give you perfect skin. Cut a leaf of fresh aloe vera and keep it in the refrigerator for 2 hours and then use it on your skin. Apply the gel on your tan area. Leave it on your skin for 30 minutes. Aloe vera is known as the cooling ingredient and soothes the skin. Aloe vera is a good source to treat tan effectively. Clean your tan area and rub half of the tomato in circular motion for 10 minutes. Leave it on your skin for 20 minutes. Do this on every alternative days. Tomato is known for it’s depigmentation properties. It will help to remove tan. Squeeze the juice from tomato and add sugar in it. Apply it on tan area and do scrub with a little pressure. Don’t be so harsh. Do this for 5 minutes and leave it for 10 minutes. Do this on every 2nd day. Tomato is great way to remove tan and when mixed with sugar it acts as a great exfoliator. It will remove tan easily. Apply milk with the help of a cotton ball on clean skin. The presence of lactic acid in raw milk fade away the tan and even out the skin tone. Make a paste by adding rose water in sandal powder. Apply on face for 20 minutes. Wash your face with simple water. Sandalwood has the cooling properties which soothes the skin and also make it fair. Rose water too provide cooling effect to the skin. Add few drops of lemon juice in honey. Apply this pack on your affected area for 20 minutes. Honey is only that product which is used in so many things. Honey helps to remove tan from the skin without harming it and also make skin soft. Lemon is good for lightening the marks. Grate the papaya or make a paste. Apply it on your face for 20 minutes. Do this every alternative days. Raw papaya remove the tan because of it’s exfoliating and brightening properties.This is one of the best fruit for skin and best natural home remedies to remove tan. Apply yogurt on your clean face. Do this daily two times. Yogurt soothes and smooth the skin and also give cooling sensation to the skin. It will help in removing tan. Mix both the ingredients and apply on your face. The citric properties of tomato removes the tan in a very easy and natural way, whereas yogurt moisturize the skin. ½ tbsp of coconut oil. Mix the sandalwood powder with coconut oil. Apply on face and neck for 20 minutes. Sandalwood is loaded with so many skin benefits and when it combined with the goodness of coconut oil it will remove tan from your skin and add a glow. Crush the strawberries with milk. Apply this pack on skin. Strawberries are the natural exfoliator that remove the dead skin cells and tan from your skin. Grate a potato and extract the juice. Apply the juice on your skin with a cotton ball. Potato is known for the cleansing and bleaching properties. It will lighten the skin and remove tan. Rub the ice cubes on sun burnt area and tanned area for a few minutes. Than wash again with normal water. Do this twice a day or when ever you want to. Rubbing ice cubes on sun burnt will provide cooling and soothes the skin. It will help to lighten the skin from tan. Mix the multani mitti with rose water and make a smooth paste. Apply this on your face, neck and body for about 15 minutes. Rinse it with normal water. Multani mitti is great way to treat tan problem. It cools the soothes the skin. It cleanse your skin and make it clear from any skin problem. Add rose water into the gram flour and mix it well. Apply it on your face and neck for 15 minutes. Gram flour is a natural exfoliator that gently remove dead skin cells and tan. It will brighten up your skin as well. Boil or brew the green tea and let it cool. Apply it on your tanned skin with the help of a cotton ball. Leave it for 10-12 minutes and rinse with water. Green tea is a good source to provide cooling and soothing effects to skin. It will remove tan and blemishes. Mix all the ingredients with enough water to make a paste. Apply this on your face and neck for 10-15 minutes. Rice flour soothes the skin and also brighten the skin. It will also remove the tan from the skin. In a bowl sprinkle the sandalwood powder and soothe tomato in it. Rub it on your face or other body part where, there is tan and do this for 10 minutes. Leave it for 10 minutes and wash it off with normal water. Tomato is very helpful in treating the tan and pigmented areas where as sandalwood is known for it’s cooling and fairer properties. Mix the honey in pineapple and mix it really well. Apply it on your skin and keep it for 10-15 minutes. Pineapple extract contains bromelain that can help remove the dead skin and also remove the tan. Make a rough paste by mixing all the ingredients. Apply on affected area and leave it for 30 minutes. Red lentil is a good source for removing tan and when mixed with the remaining ingredients it works as wonder for tan. Dip the cotton ball in the rose water . Apply it on the skin and leave it overnight. Wash it with cold or normal water in the morning. Rose water freshes the skin and lighten the skin also. It will remove tan effectively. Mash the papaya and add honey in it. Mix them well and apply on your face. Wash this with lukewarm water. Papaya exfoliates your skin and remove the dead skin cells. It will lighten the skin and remove tan. In a bowl mix the turmeric and milk. Apply it on your face. Let it dry completely. Turmeric is known for its healing properties and milk is a good exfoliator and cleanser, which is good for removing tan. Dip the cotton ball in coconut milk. Gently apply it on your face and affected area. Keep it for 10-15 minutes and rinse with normal water. The presence of the mild acid will slowly remove the tan from your skin and make it soft. In a bowl mix the coffee with rose water and make a smooth paste. Apply it on your face and massage for 5 minutes. Coffee is a great exfoliator for the skin. It will help in removing tan and make skin fair. Mix the oatmeal with buttermilk. Massage this paste on your skin in circular motion for 5 minutes. Buttermilk will soothe the skin and oats are good way to exfoliate the dead skin. Apply vicks vaporub on affected area for few hours. Yes it’s a bit surprising but Vicks vaporub is a great way to remove the tan from body. It will soothes and moisturize the skin. These remedies will give you the solution, but you have to be patient as home remedies to remove tan work slow. But whenever you are going outside wears sunscreen as said prevention is better than cure. Do leave your comment below and share it with your friends, Thank You. So many useful tips. Thanks for sharing. Such an exhaustive post i must say.. Havent tried tomato yet will try it. Extremely useful tips for me! I got really tanned because of my frequent trips to and from my kids school!! Will surely stRt at the top of this list! Easily available at home stuff to keep skin looking great…nice!